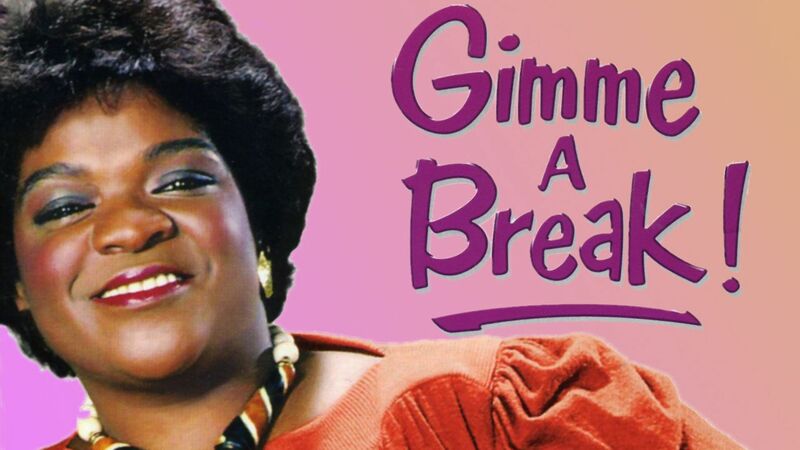 Here's where to watch every episode of Gimme a Break! season 5. Mouseover or tap an episode to see where to stream it. Click or tap the play icon to stream it on the best available service. Joey's Train Sep 14, 1985 Nell is sad and doesnt want anyone to remind her of the Cheif since he pased away. Joey recives part of a toy train the Chief gave him, and puts it in the Cheifs room. Nell get mad when Jonathan insists that he and Julie move into the Cheifs old room, but gets extremely mad when Joey plays with his train in it. Grandpa says that Carl would have been happy that the family is still together, bringing him up in their daily discussions. He says that they all loved him, and that it's not right to not talk about him, because he was loved by them. Nell then changes her mind and lets Joey keep the train in the Cheifs old room, and lets Julie and Jonathan move into it. Ship of Fools (1) Sep 21, 1985 Nell decides to take her ex-husband's offer up on performing on his ship. While she is on the ship,she finds out that Tony has left his second wife, who is many years younger than Nell. Ship of Fools (2) Sep 28, 1985 While continuing to perform on Tony's ship, Nell discovers that he has fallen in love all over again with a woman that Joey befriends on the ship. The Man From Zoron Oct 5, 1985 Joey is saved by a man from being hit by a bus, and when the man tells his family that he is from another planet, everyone but Nell believes him. The man says he is from Zoron, and that he doesnt have a last name, and is known as ""cute"". In the end, the man leaves, and the family still beleives he is from another planet. Addy's Goodbye Oct 19, 1985 Nell finds out Addy was given a teaching job as the a Dean at Columbia University by a professor she despises and thinks is tricky. Nell and Addy get into a fight at her goodbye party, and Nell does not want to say goodbye to her. However, in the end, she decides it's the best thing to do. She goes to Addy's apartment to say her goodbyes, but when she gets there she finds Addy unpacking, only to hear that the profssor is tricky and selfish, and was only pulling her legs about getting the job on New York. So Long, Jonathan Oct 26, 1985 Jonathan leaves on his archeological Mexican dig project. In the meantime, back at the Kanisky house, Julie finds out that she is pregnant with his baby after she decides to go to enlist in the Navy and fails the test. Mama Nov 2, 1985 Mama Maybelle arrives in Glenlawn to visit Nell, and tells her that she has to have an eye operation, and fears that she may never be able to see again. She tells Nell that she is going to miss seeing, but her sense of hearing may improve, which will help her hear Nell's singing better. Nell is happy that her mother admits she is a good singer. In the end, she is fine, and the family is there to greet her after the operation. Sam's Little Girl Nov 9, 1985 Sam is taking the role of a big sister to a girl named Pam, a kid from a single-parent home. When Pam arrives at the house, Sam has other ideas of her own, when the new neighbor Chip shows up and asks her to light his pilot light on the stove. Nell is then stuck taking care of Pam, and she is a nuissance to her. Nell then finds out from Sam that Pam's mother left her father for a computer repair man, and Nell finds a way to make Pam like her in the end. The Elevator Nov 16, 1985 Nell finds out that Addy is engaged to be married to her dentist, who has been previously married before, and has several children from each marriage. When Nell decides to accept Addy's engagement as a sign of happiness for her, she helps her select her wedding ring. However, when they begin to quarrel again over the engagement, they both go into seperate elevators, and they break down. Nell gets on her phone and Addy gets on hers and they talk to each other about past times in Alabama to get them throguh this horrific moment. When Nel tells Addy she should call her fiance, his new girlfriend answers, and Addy decides to shut him out of her life forever. Finally, the fire department arrives and gets them to safety. Nell's New Car Nov 23, 1985 Nell finds out Addy is selling her car, and wants to be the first one to take it off her hands. However, Angies sister has already purchased it, and Nell talks her out of it. When Nell takes it for a test drive, it breaks down, and she tells Addy that she wants her money back. Addy refuses, but in the end gives in, after she finds out that she is getting money back as well for it. Nell's Gifted Child Nov 30, 1985 Nel finds out that Joey is a gifted child, and should take a test to see what grade he should be placed into. When Joey tells her that the 4th grade is fine, and that he just wants to play baseball, she insists that he take the test, and gives him several instruments to play to see which one suites him best, the piano being the top. In the end, Joey runs off to the park, and Nell knows he is there when she finds out he wasn't at the school to take the test. She decides to let Joey stay in the 4th grade because a nine year old is supposed to have fun, and not work their tail off. Katie's Apartment Dec 7, 1985 Nell finds out that Katie is dating a married author of a famous book. She tells Katie to stop seeing him, and she tells her she is old enough to do what she wants. Katie then tells Julie to come to her apartment and asks her for advice on what to do. In the end, Katie decides to not see him anymore. Snippets Dec 14, 1985 Nell and the gang decorate the Christmas tree as Joey pretends that he is sick, but wants to help out as well. During the Christmas gathering, the family recalls events from the past. In the end, Joey tells Nell that he was only pretending to be sick because he didn't have enough money to buy her a Christmas present, but she tells him it doesn't matter. Second Chance (1) Jan 4, 1986 Nell decides to quit college and pursue a real singing career. She becomes the manager for an ex-con who wrote a song in jail and decides to put it to music. When Nell and the ex-con go to Skipper Dwane's for amature night to perform the song, Gary Collins is there, and Nell asks him if he liked the song. Gary says he hated it when the ex-con sang it, but when Nell signs it, he insists that he put Nell on his hour magazine show. When Nell goes backstage to tell the ex-con how he did, she freaks when he has a string of floss out and thinks he is going to kill her. She tells him that she thinks he is going to kill him because Gary hated his song. Second Chance (2) Jan 11, 1986 The ex-con is sad that Gary hated the song, and decides that singing is not the career for him. Nell then appears on Gary Collins' Hour Maganzine Show, and decides to go back to college afterall. Bienvenido, Jonathan Jan 18, 1986 Jonathan returns home, giving attention to everyone accept Julie, who beleives that Jonathan doesn't love her anymore. In the end, Jonathan tells Nell that he knows that Archaeology is not the career for him and that he rushed into things by marrying Julie and getting her pregnant. He tells her he was not at work when they called to talk to him, and instead he was in Bakersfield, looking at a chalk factory that he hopes that he and Julie will soon run in the near future. Nell tells him that Julie needs him, and he should tell his problems to her instead. He finally tells Julie his problems, and tells her that they will be great parents soon when their baby is born. The Gun Feb 1, 1986 Joey accidently shoots Nell when he finds the cheif's gun in one of her dresser drawers. The whole family, including Mama Maybell, who comes for a visit, helps Nell out when she is shot in the foot. However, Joey runs off everytime he comes face to face with Nell. In the end, Joey wants to buy Samantha an ice cream cone after he accidently hit her finger with a baseball, and Nell decides to take him to get it. When they get in the car, the engine sputs, reminding him of the gun, and he tells Nell that he is finally sorry for what he had done. A Lesson for Nell Feb 8, 1986 Nell finds out that Grandpa is dating Sally Parsons, who was previously dating Officer Simpson. When Simpson finds out he takes it like a baby, but Nell takes it much personal, and tels Sally never to see Grandpa again. In the end, Nell learns that she shouldn't have been snooping into Grandpa's life at all. Pride and Prejudice Feb 15, 1986 Nel is rejected for a job as a receptionist because she thinks she is black. When Addy decdies to go for the same job as well, she is rejected too. They decide to take the case to the Congress of Determined Women, but find out that the man who rejected them is for black rights, and decided to hire a black man instead, because he cannot work with women because they drive him crazy. Family Reunion Feb 22, 1986 Nell's sister Loretta comes to town when she decides to leave Howard. She confides in Nell on what to do, but Nell doesn't know what she can do to help. Mama Maybelle shows up and calls Nell a homewrecker, and Joey is mad at Nell when he is getting bad grades because he is devoting all of his time to baseball. Loretta tells Nell that Joey should do what he does best, and Nell knows she is right. In the end, Mama hears that Loretta left Howard, and Mama tells her to go back to him, which she agrees to. Getting to Know You Mar 29, 1986 When Officer Simpson leaves his cousins adopted children with Nell to babysit for her, her date who is at the house at the time lets Nell see who he really is, when he shows her his feelings that he has for kids, none whatsoever. Katie's Korner Apr 5, 1986 Katie, who has been sad since her latest boyfriend left her and is now engaged, is going broke and is deciding to close Katie's Korner. Nell knows that Katie is going to commit suicide because she is very depressed lately and gave Joey a gift for his birthday, which isn't for several months, and is giving Julie and Jonathan her car. When Nell and Addy arrive at the closing of Katie's Korner, they see the lights off and know she is inside. They throw a tree through the window as Katie comes out. Nell tells Addy that she was worried about Katie because her ex-husband Tony left her years ago and she didn't leave him. Afterwards she tried to commit suicide but couldn't go through with it. Katie tells Nell she was offered a job as a buyed at Chadwick's in SanFransisco which offers her $32,000 a year, as wel as a company car. Found Money May 3, 1986 When Nell's grandmother passes away and leaves her a nice amount of money, she decides to split it with the family, and decides to let them spend it on something that is fun since it was found. Nell goes to the bank and finds out that her check has bounded, and needs the money back, but in the end, everyone had bought her something with the money that they had given her, since she is always giving them things and money everytime they need it. The Purse Snatcher May 10, 1986 As she is at a Greek restaraunt with her freinds, Nell's purse is stolen, which upsets everyone. However, the two Grek waiters have their own plan of getting the purse back for her.